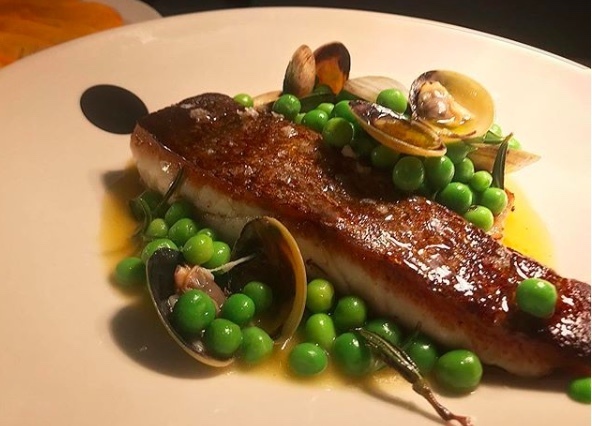 Bermagui Gemfish served with peas and pipis. Photo credit: Saint Peter, Paddington. I read about Saint Peter Fish Eatery in a foodie publication a few months prior to moving into the Paddington area. I walk past it on my way to the bus stop every morning and I felt it was time to try it out. I love eating fish and it is my local after all. The Saint Peter bold black and white sign stands out along the corridor of shops and restaurants on Oxford Street. Photo credit: Nicole James. 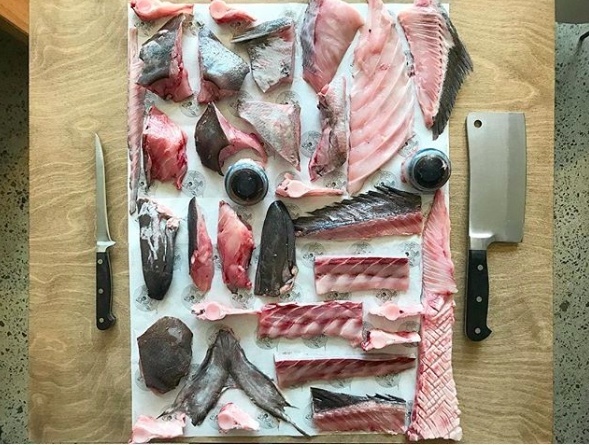 The idea behind Saint Peter is to serve the fish from nose to tail, using as much of the fish as possible, including bits such as eyes, the swim bladder and livers. Chef Josh Niland developed a method of dry-ageing fish he believes deepen the flavour. His cooking method is intriguing. Fish is bought daily and up to 65% of the fish is used to minimise the impact on the environment. Photo credit: Saint Peter, Paddington. 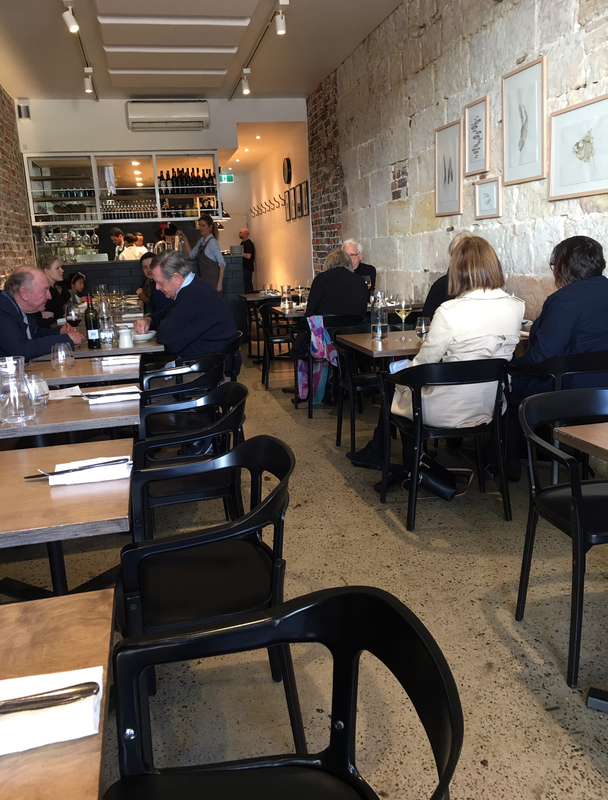 It is easy to find the restaurant as it is located exactly opposite the Paddington Markets. There is a bench outside the restaurant. Is this a sign of long queues? I have a reservation so I walk straight in. The interior is light, bright and inviting. Photo credit: Nicole James. The inside looks like a converted terrace house. It's long and skinny with an open kitchen at the far end. There isn't enough room at the table. I do like the simple decor. A few simple sketches of seafood hang on exposed brick walls. The menu is unfussy like the sign outside. It's classy, elegant and has clean lines. It is a short, one-page menu that changes daily depending on the season and what is for sale at the fish market. 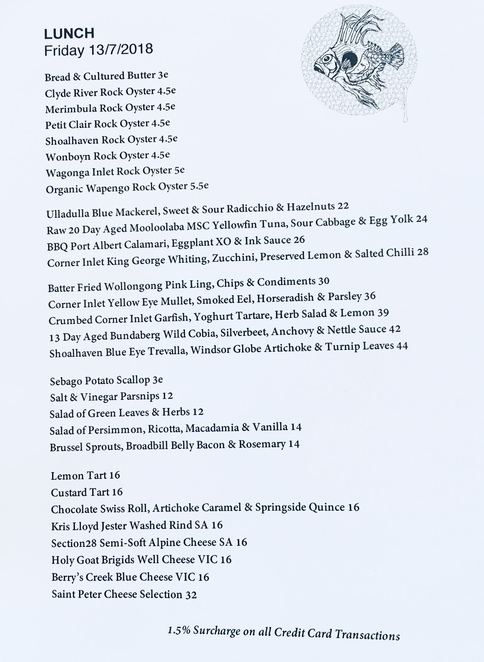 Daily menu at ​Saint Peter, ​Paddington. Photo credit: Nicole James. Our waitress suggests we share a starter and order our own mains. She warns us chef likes to cook the fish slightly underdone. There is zero chance of overcooked fish in this restaurant. Ulladulla Blue Mackerel, Sweet and Sour Radicchio with Hazelnuts. Photo credit: Nicole James. Our mackerel starter arrives and the first thing I notice is the smell. I don't think it's off, it's just a powerfully pungent fish. Eating it is better, as the red wine vinegar, juniper berries and radicchio marry well together. The hazelnuts add texture. Next time I'd opt for a sweet wine instead of a glass of Chardonnay to cut through the fatty richness. Shoalhaven Blue Eye Travella, Windsor Globe Artichoke & Turnip Leaves. Photo credit: Nicole James. The Blue Eye Trevalla with Windsor Globe Artichokes is nicely cooked. It is a delicate and light meal with a generous sprinkle of turnip leaves. Crumbed Corner Inlet Garfish, Yoghurt Tartare, Herb Salad and Lemon. Photo credit: Nicole James. Our other main is the Crumbed Garfish with Yoghurt Tartare, which is beautifully presented and supposedly deboned. However, we find bones. 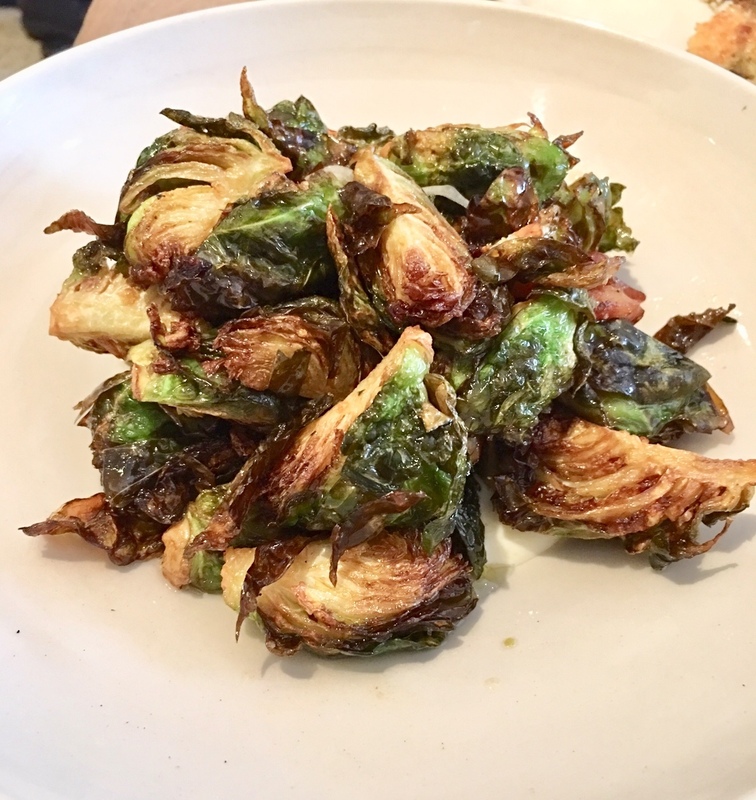 The Brussel Sprouts with Broadbill Belly 'Bacon' is to die for. Photo credit: Nicole James. We share the chargrilled Brussel sprouts. They are halved, chargrilled and come with what looks and tastes like bacon, but is fish - amazing! The whole dish is out of this world tasty. Lemon Tart and Custard Pie grace the dessert menu. Photo credit: Saint Peter, Paddington. I am too full for dessert, but on the menu, there is lemon or custard tart, chocolate swiss roll or a selection of local cheeses. For reservations call 02 8937 2530 or email hello@saintpeter.com.au. Note that there are two lunch sittings on weekends and two dinner sittings each night. The best time to go is Friday lunch as there is only one sitting. 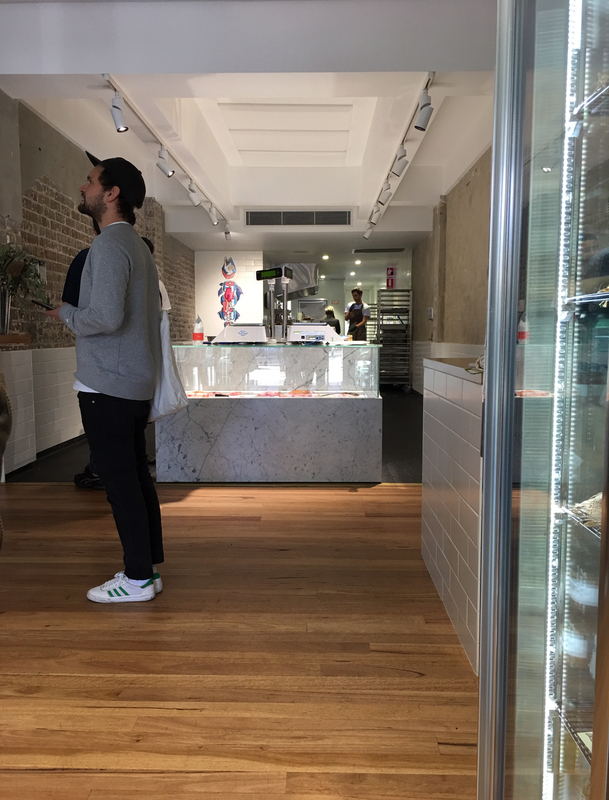 The ​Fish Butchery at 388 Oxford Street is open Wednesday to Sunday 11am to 8pm. I feel a few takeaway dinners for my household coming up. Photo credit: Nicole James. A few doors down, there is an upmarket deli called Fish Butchery, selling the restaurant's produce. The vibe is casual and for a fraction of the price, you can enjoy the same posh food in the comfort of your own home. Merchandise for sale at the Fish Butchery, a few doors down from the main restaurant. Photo credit: Nicole James. Fish sausages are hanging in the window next to whole, drying fish. The fridge cabinet has Ling Pie, Fish Fillets and Spanish Mackerel Fish Cakes ready to take home to cook. ​The Fish Butchery is ​an upmarket delicatessan and takeaway. They sell what is arguably the poshest fish and chips in the Eastern Suburbs. Photo credit: Nicole James. If you don't fancy cooking, the takeaway is good value. For example, the same Pink Ling Fish and Chips costs $20 versus $30 in the main restaurant. For more information about the Fish Butchery click here. ​Takaway menu ​at the Fish Butchery. They also have dinner packs available for sale, which is prepared fish and seafood packaged up ready to take home and cook. Photo credit: Nicole James. For reservations in the restaurant, call 02 8937 2530 or email hello@saintpeter.com.au. Note that there are two lunch sittings on weekends and two dinner sittings each night. The best time to go is Friday lunch as there is only one sitting. The bathroom is light and bright and clean. I like the Who Gives a Crap emergency toilet paper roll. Photo credit: Nicole James. Seafood fans will rejoice eating here. I highly recommend a meal at Saint Peter to judge for yourself if it deserves to be voted third best restaurant in Australia by the Australian Financial Review (June 2018). Why? A Pescatarian’s Delight, even the ‘bacon’ is made from fish. Some really special look meals there. Sounds fantastic. 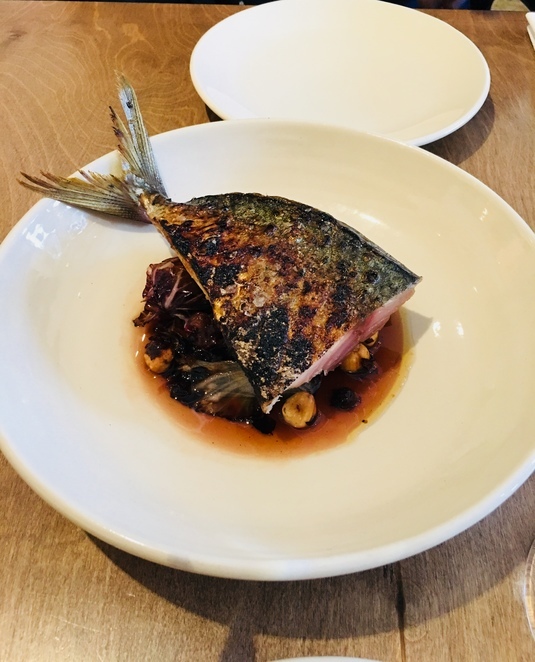 Posh fish and chips in Paddington? What a joke. Whats this posh rubbish, what snobbery. I'm so glad I don't have to come into Paddington to eat. I just stay in Blacktown and I can eat very good fish and Chips and even better and cheaper. The Brothers fish shop in Seven Ahills sells some of best fish and chips. We don't have to be posh. People from so many nations sell some of the best food I have eaten. Sonia Bennett.